Nature inspires a lot of our home interiors, and on a beautiful clear day you may have wondered about painting faux clouds and sky to bring an element of nature inside. Faux painting, or Trompe l'oeil (French meaning 'trick the eye'), was invented by the Greeks, but developed by the Romans, to increase the feeling of space in a room. Painting clouds and sky using faux paint techniques is one of the best ways of creating the feeling of space. To create a faux painted cloud and sky design - paint, brushes, a sponge, and a dishcloth, are all that's required. Begin by preparing the walls with a warm toned paint wash - a mix of red, yellow, orange paint etc, diluted with water. No care is needed at this stage, just slosh it on to create a warm background for the sky. This initial process is necessary so the faux painted sky will not appear cold. When creating a faux painted sky, it is worth noting that blue sky is darker at the top, graduating to a lighter tone at the horizon. For this reason, it is advisable to have a mix of three or four blues to be used when creating the faux painted sky. A mix of blues could be used initially, adding different quantities of white for each pot. It is obviously important to ensure enough of each blue tone is mixed, as creating the same tone again would be very difficult. Starting at the top of the wall with the darkest color, work around the room in horizontal strips with a wide paintbrush. Before this color is completely dry, apply the next darkest color underneath, and work these two colors into each other with a different brush. It is advisable to keep two brushes on the go at any one time, so that one stays in one color, and the other in the next color. Immediately soften the edges between one color and the next using a damp dishcloth. Use this method until all blue tones have been used, and the ‘horizon’ is reached. If the initial result isn't perfect, wait for the paint to dry completely, and tackle that area again, working in horizontal strips from top to bottom and back up again. 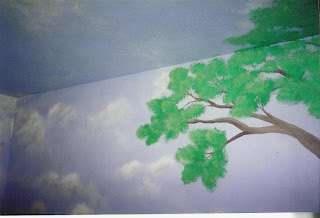 It will create a faux painted sky with more depth and interest. Before painting clouds, bear in mind that clouds are not pure brilliant white, neither are they regular in shape. Begin with a standard white paint and add hints of grey, and a small amount of purple until a less perfect white is achieved. Dip a small natural sponge into the mixed color, and dab off some of the excess before applying the paint to the walls. Gently pat an almost dry white paint onto the wall, until a satisfactory cloud shape is achieved. 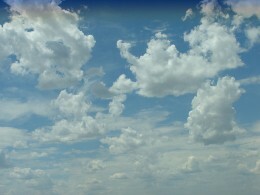 Unlike painting sky, overworking painted clouds makes them look less realistic, so once your shape is achieved, move on. Using a small paintbrush, with a more 'true' white paint, create highlights to the top and halfway down one side of each painted cloud. Soften the edges of these highlights, again with the damp dishcloth, until you are happy with the finished result. Hopefully by this stage, the question of "How can I faux paint clouds and sky?" will have been answered, and you may now need some ideas to progress your design further. As well as the feeling of space a faux painted sky and cloud design brings, it also has the added benefit of being versatile. By adding detail to the horizon, such as sea, or rolling hills, the look can be updated according to the usage of the room. 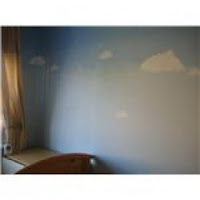 A baby nursery with a countryside theme could then be updated into a jungle or dinosaur themed room, as the child grows, leaving the faux painted blue sky and cloud design in place for years to come.